This statistic gives information on the number of registered users of the chat-app LINE. As of the beginning of October 2014, the Japanese chat app had 560 million users worldwide, up from 400 million users in April 2014. LINE is a global chat app developed for Android and iOS smartphones which has since expanded to other mobile platforms and a desktop client. Originally created during the aftermath of the Tōhoku earthquake in March 2011, LINE was initially developed as an internet-based communication platform that could function without the then-damaged telecommunications infrastructure in Japan. LINE supports text and multimedia messaging and revealed a daily message volume of 10 billion messages in early April 2014. Users can also send photos, purchase stickers similar to emoji and make free voice calls similar to Skype. LINE’s free messaging service proved a popular alternative to text-messaging and the app reached 100 million registered users within 18 months of its release. Aside from the instant messaging features, LINE has also integrated social networking elements such as user profiles as well as a personal timeline that allows users to share personal status messages with contacts in real-time. Despite being devised as a mobile messenger, LINE has successfully transformed into a social app platform with a strong social gaming presence. Since launching in July 2012, the chat app’s gaming platform LINE Game has passed 300 million downloads. To access LINE Game content, users need a LINE account. The games feature strong social components as well as in-app purchases and thus strongly contribute to the company’s revenue stream. 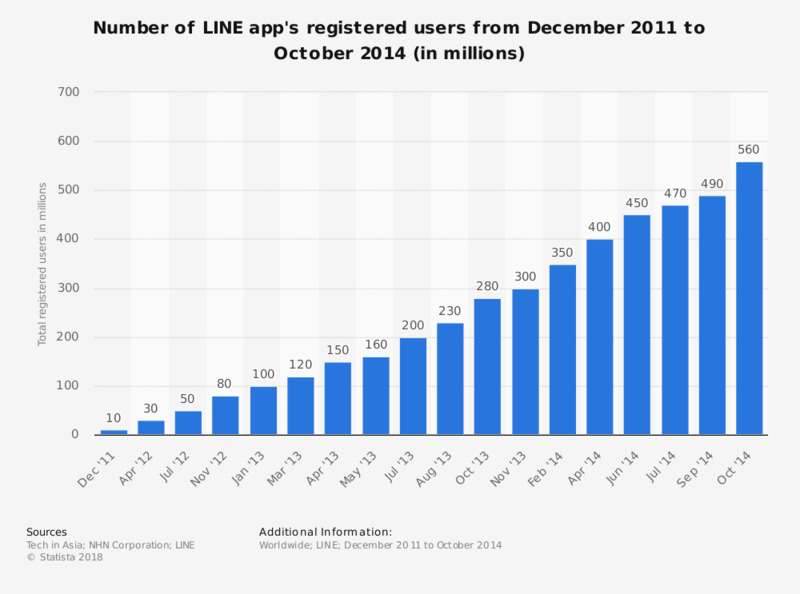 LINE started reporting monthly active users as of October 2014.